Psyllium Husk: The dried husk of Plantago ovata. 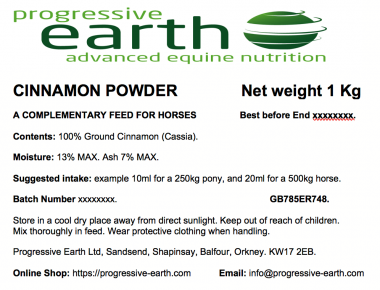 Complementary feed for horses to clear sand, dirt and debris from the gut. Supports healthy gut function, soothes and clears sand and debris from the digestive tract. Psyllium husk is a highly soluble fibre source. It forms a gel-like substance inside the digestive tract that acts like a sponge, removing unwanted foreign material such as sand, toxins and debris. Horses grazing on short grass, sandy soil or close to a sandy environment. Helps maintain a healthy digestion. Helps remove toxins and undigested matter from the digestive tract. Particularly helpful at removing sand grit and dirt from the digestive tract. 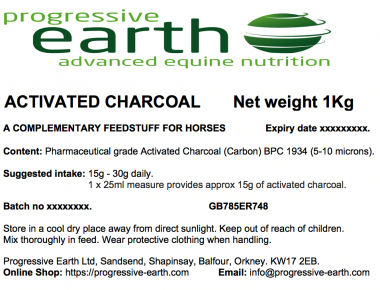 Helps horses prone to bloating and excess gas. As a short term 5 day course (Recommended for horses grazing on short grass, sandy soil or close to a sandy environment). Suggested intake: 20 grams per 100 kilograms of body weight for 5 consecutive days, every 2 months. Split between 2 feeds. For long term use/maintenance. Suggested intake: Ponies up to 400 kilograms feed 25 grams per day. 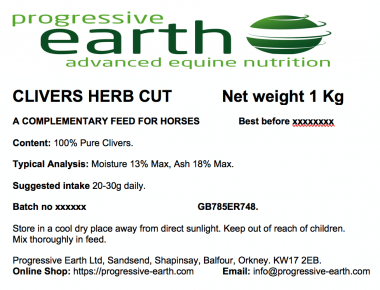 Horses 400 kilograms and above feed 50 grams per day. 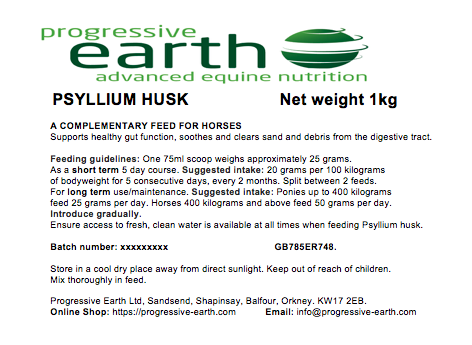 Introduce gradually and ensure access to fresh, clean water is available at all times when feeding Psyllium husk. Human grade Herbs used in this product. 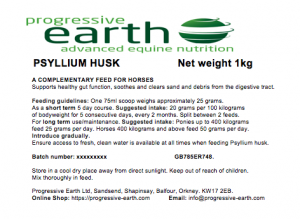 Pack size and availability: Progressive Earth Ltd Psyllium Husk equine feed supplement is available in resealable grip seal pouches containing 1 Kg of product.